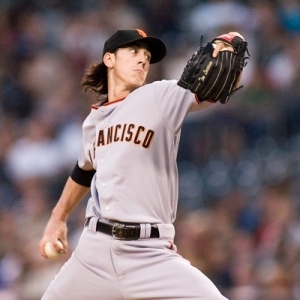 San Francisco Giants Pitcher Tim Lincecum ...so fierce that the Rangers forgot that they were a hitting team. Art takes many forms. Tonight’s World Series game was a spectacular performance…with the combination of Giant’s pitching ace Tim Lincecum’s 8 inning torrent, a 7th inning a home run by Edgar Renteria that brought in two Giants teammates on base, and Brian Wilson’s confident 9th inning closing pitches, the Giants won tonight’s game again the Texas Rangers 3-1 and their first World Series chamionship since 1954. I am proud of our champions. 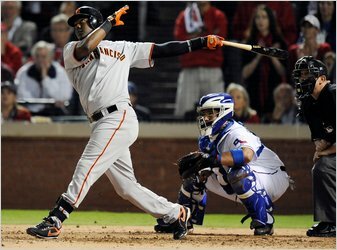 Edgar Renteria's 7th inning home run over the left-center fence brought in two teammates and gave the Giants a 3-1 win over the Rangers, clinching the World Series for San Francisco. John G, Mablanglo/ European Pressphoto Agency.